The Cucagna Castle in Faedis (Udine, Italy) was built with the license from the Patriarch of Aquileia Popone in 1027. Cucagna is a remarkable example of fortified medieval architecture of the eastern foothills of Friuli. The exclusivity of the site is represented by its architectural and archaeological integrity, where we can easily identify paved paths, historic stone quarries, connecting walls, entrances, gate towers, fortified ramparts, moats, towers and shielded buildings, walls, foundations of drawbridges, natural caves. In addition, the site is surrounded by its original environment, characterized by a large wooded almost untouched area of great natural beauty. The Institute has its headquarters in Borgo Stremiz di Faedis, an ancient village mentioned for the first time in 1294 and subject to the jurisdiction of Cucagna since the XIII century. Here is available a conference room, accommodation and facilities that can accommodate up to 20 people for seminars and other events. There is also a restoration workshop for archaeological finds. The Institute was founded on December 23, 1984, and since then operates with the recognition and the financial support of the Regione Friuli Venezia Giulia for the organization of the Summer Seminar of Medieval Architecture – S.E.I.A.M. In 1993 it obtained the recognition of the Italian Ministry of Foreign Affairs-Directorate General for Cultural Relations and was is included in its “Youth Exchange” programme. In 1998, the European Commission, under the Raphael program, choose the S.E.I.A.M among 99 projects for professional exchanges in the field of Cultural Heritage. It was the only Italian project presented and funded. In 1998, the Institute enters into a bilateral agreement with the Humboldt Universität zu Berlin (Germany), Faculty of Prehistory and Archaeology, proposing a six-month course open to archaeology students from European universities, which provides the study of different archaeological excavation methods and participation in an archaeological excavation on site, under the supervision and direction of the archaeological Survey of Friuli Venezia Giulia. In 2002 the University of Berlin (Germany) officially entrusted the teaching appointment for the course of medieval archaeology at the Institute’s Director Roberto Raccanello. 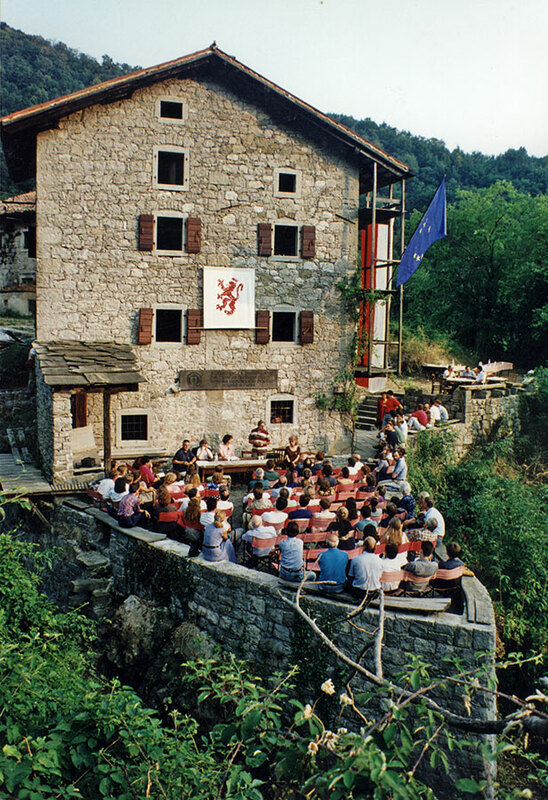 From 2001 to 2004 the Institute is credited among the Cultural Bodies of Relevant Interest in the Autonomous Region Friuli Venezia Giulia. In 2002 was signed a second bilateral agreement with the Gediminas Technical University of Vilnius (Lithuania), Faculty of Architecture, for the creation of an annual course of measurement, analysis and graphic reconstruction of historical monuments to the state of ruin open to architecture students. In 2007 started the collaboration with the Albert-Ludwig University of Freiburg (Germany) with regard to educational archaeological excavations, open to students of the Faculty of History and Archaeology for the course of consolidation and safeguarding of the archaeological finds. On July 25, 2007 after 25 years of research and reconstruction, with the blessing of the St. James church, the Cucagna castle was opened for the first time to cultural events of all kinds. This milestone was achieved with the help of hundreds of volunteers, both local and foreign. In 2008, thanks to the contribution of the Wissenschaftliche Gesellschaft Freiburg (Germany) opened the archaeological restoration laboratory based in Stremiz di Faedis. New partnerships were initiated in 2014 with Yvonne Knevels, professor at the University of Hasselt (Belgium) and the SuPerAlberi company, specialised in arboriculture. Roberto Raccanello: architect freelancer with over 40 years of professional experience in the restoration of architectural heritage and castles of medieval times. Since 1984 he researches on issues of architectural restoration, traditional building techniques, earthquake engineering and historic medieval archaeology. He designed and directed the restoration of more than a hundred historic buildings. Holger Groenwald, archaeologist and researcher of Medieval Material Culture. He graduated from the Humboldt University of Berlin and has recently completed his PhD on “Archaeological evidence and evolution of the settlement system in Friuli in medieval times. Role and development of Cucagna Castle and its activities in north-eastern Italy”. On behalf of A.L. Universitaet Freiburg, Groenwald has served as director of the excavation campaigns in Cucagna since 2007. Yvonne Knevels, international artist-artisan, with extensive experience of research and practice in wickerwork who has investigated ancient techniques in different parts of the world and uses them in her daily work as well as in contemporary art installations. She is a graduate of the Academy for Applied Arts (SHIVKV) of Genk, Belgium and graduated in wickerwork techniques and willow cultivation from the National Academy Ecole Nationale d’Osiériculture et de la Vannerie in France. She is currently a lecturer and researcher at the Faculty of Architecture and Arts of the Hasselt University. Andrea Maroè, agronomist, certified teacher in Urban Ornamental Arboriculture, Tree-climbing Instructor. Specialized in the evaluation of the stability and viability of trees. He has been responsible for the masts of the city of Genoa, Director of Public Parks in Udine and Gorizia, Past President of the Italian section of the International Society of Arboriculture and of the Italian Consortium of Arboriculture, he is currently Director of Monumental Trees Bureau of the City of Udine. Dumitru Ion Serban is an international artist-craftsmen, with extensive experience of research and practice in stonework who has investigated ancient techniques in different parts of the world and uses them in his daily work as well as in contemporary art installations. He is a graduate of the Sculpture Department of National University of Arts in Bucharest, Romania. He has then specialised in Scientific Basis of Restoration with expertise in stone, ceramics and glass, through specialization courses in Romania, Italy, United Kingdom. He has had solo exhibitions since 1990 in Romania, Italy, and Greece and participated in international symposiums in Italy, Hungary, Turkey, Egypt, India and New Zealand. He received numerous international awards and prices for his work. Katharina von Stietencron graduated in architecture at the University of Stuttgart (D). Since 1993 private practitioner working with the architectural firm R. Raccanello dealing with the design of architectural restoration. Since 2007 co-owner of the firm Raccanello & Von Stietencron. Since 2000 she is Vice President of the Institute for Reconstruction of Chucco-Zucco Castle. Responsible for the design of teaching and scientific training of the Institute, she teaches the course of surveying and architectural restoration as part of the International Summer Seminar organised by the Institute. Livia Maria Raccanello anthropologist with a master’s degree in international development cooperation, with particular attention to human, social and cultural development. Working in international development cooperation since 2004 with field experience in micro rural projects in Asia and Latin America. She then specialized in the management of European cooperation projects in the field of Higher education at the European Commission from 2010 to 2013. She has studied and documented issues such as the status and organization of indigenous women in Guatemala and social and cultural characteristics of the Irula tribe in southern India. Gulay Yilmaz, architect, graduated from Mimar Sinan University of Istanbul, passionate about medieval castles. She collaborated since 1995 with the Institute in the organization of educational seminars, mainly dealing with the management of volunteers and logistical coordination. Markus Brückner, graduated in pre and early history at the Humboldt University Berlin in 2011. He participated in the educational excavation at the castle of Cucagna in the years 2004-2009, for the excavation campaign of 2011 he was given the scientific direction and teaching from the A.-L.-Universität Freiburg. Since 2011 he works as a freelancer in excavation and archaeological research projects in Germany. His interest focuses particularly on the medieval period. David Raccanello, passionate about restoration and photography, has worked with the Institute since childhood by participating in early seminars. He is the official photographer of all events organized by the Institute. Giuseppe Assirelli (30.4.1950 – 17.5.1998) fotografo, socio dell’Istituto tiene i corsi di fotografia con l’aiuto di Jurko Lapanja al SEIAM dal 1985 al 1990. Attilio Balloch (21.3.1936 – 20.6.2002) muratore e scalpellino – è l’artefice principale della integrazione delle murature del Castello di Cucagna dal 1987 al 1995. Mario Balloch (29.6.1933 – 23.10.2010) muratore e maestro d’ascia – tiene i corsi di squadratura delle travi con l’ascia al SEIAM dal 1987 al 1995. Romano Binutti ( 18.03.1948 – 15.01.2008) geologo e storico, fondatore e conservatore del Museo del Fossile di Forame di Attimis, ha collaborato durante i seminari del SEIAM. Giampaolo Boegan (31.7.1947 – 20.3.2012) braccio destro del direttore nella logistica e coordinamento del SEIAM dalla fondazione al 1999. Guglielmo Coronini Cronberg (7.7.1905 – 13.9.1990) storico – L’architetto Raccanello nel novembre 1984 visita il conte e lo mette a conoscenza dell’intento di ricostruire il complesso dei castelli di Zucco e Cucagna. Entusiasta dell’iniziativa, avendo egli stesso ricostruito in gioventù il castello di Kronberg, concede la riproduzione dello stemma Zucco-Cucagna dall’Archivio Zucco in suo possesso, che aveva acquistato a Vienna da un rigattiere e che oggi si trova presso l’Archivio di Stato di Gorizia. Lo stemma diventa il logo dell’Istituto. Il conte nel 1985 diventa socio dell’Istituto e disegna il leone rosso dello stendardo ufficiale dell’Istituto. Dr. Giulio Geatti (6.2.1949 – 24.11.1991) É stato il promotore dell’iniziativa di recupero dei castelli di Faedis. Nel 1983, allora segretario comunale del Comune di Faedis, si è prodigato affinchè l’architetto Raccanello riuscisse a partire nell’opera di ricostruzione dei castelli. Matthias Kummel – archeologo (19.2.1973 – 16.7.2012) collabora dal 2003 al 2008 al SEIAM. Dr. Vinko Šribar (19.7.1922 – 6.6.1996) archeologo dell’Università di Lubljana, collabora al SEIAM dal 1987 al 1996. Egli interpreta il sistema difensivo formato dai castelli di Rodingerio-Cucagna-Zucco-Borgo Fortificato di S.Anastasia-fortilizio di S.Margherita che chiude la valle del Grivò all’accesso dal Passo di Lonc come facente parte del sistema Claustra Alpium Iuliarum, fortificazioni dell’età romana, costruite per difendere le regioni al confine orientale delle Alpi Giuli. Vinicio Surci (7.10.1925 – 18.6.1998) – maestro toscano costruttore di volte ha insegnato nel SEIAM e seguito la ricostruzione della volta di copertura della Torre e della Cisterna di Cucagna. Attilio Basilio Toffoletti (5.11.1907–19.12.2002) – tiene i corsi di scalpellino, estrazione e lavorazione della pietra, dalla fondazione del SEIAM al 1997.